In my 1st blog about SAP Solution Manager with Focused Build add-on I wrote about the first steps to ensure that a projects work can be structured by work packages and scoped with the usage of controlled documents. This blog will shed light on the building and testing functionality. At the end of that blog You will be able to evaluate if the additional functions coming with the additional add-on are valuable. Now I will talk about the phases build and test of the software development process covered by Focused Build. One of the most valuable functions is the “test suite dashboard”. Together with the information in the “solution readiness dashboard” you should be able to have a completeness-matrix and a kind of traceability-matrix for your multi-projects. My point here is to enable a Requirements traceability (please see the appropiate wiki entry for more information about that). Please be aware that in Solution Manager version 7.2 work packages are linked indirectly to process-steps via requirements. In version 7.1 you can link the work packages directly to a process-step. The dependencies between blueprint (plus technical design, process id), development objects (build and test phase, with development IDs), optional user-stories (as basis for test cases), “work packages” (here in the lines symbolized by requirement 1 to 3) and status of the test cases are shown in the following figure 1 as an example. Empty cells mean “not complete”. As a further example the column 4 (user-story, test case) shows an empty cell meaning that a test case is missing which is describing how to test the requirement 1. “Which work packages are not covered by a testplan ?”. (= business server page) called “/SALM/MANGO_TESTER”. 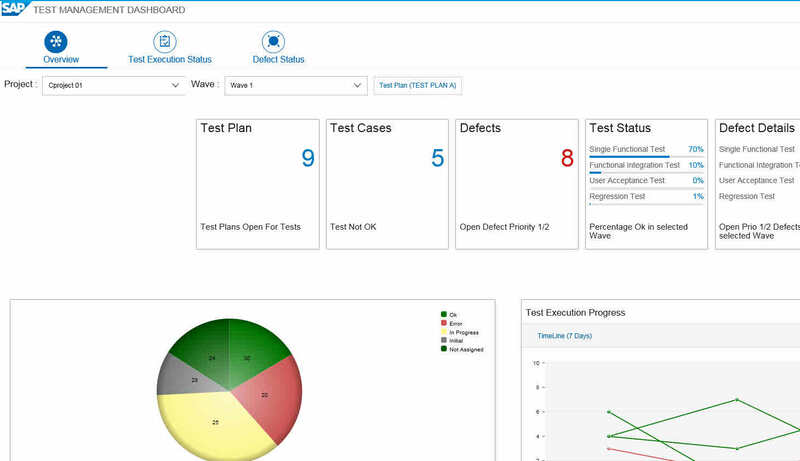 So “mango_tester” will open the FIORI app for the “manual test execution”. I didn’t talk about roles in Focused Build yet. For the actions and responsibilities in this blog series the roles test manager, tester and release manager are important. You will find these roles by entering “/SALM/*” in tcode PFCG. As a tester you started your tester work packages (tcode STWB_WORK) and executed the tests. If an error occured a defect should have been created. At the end of the day the test manager had to gather all information and use the right reports and overviews to get an overall status. All in all a way through 3 to 5 (or even more) different transactions using at least 3 user-interface technologies. A Solution Manager system with version 7.2 (without add-on Focused Build) has a “test suite” right in place. Test planning, test execution (as a tester) and the business process change analysis are available there. There are advanced features and testing capabilities in Solman Version 7.2. There is no real check report for testing abilities available. The user interface technologies have been reduced. The steps to a successful setup of testplans and tester work packages have been harmonized. The creation of a defect is much easier. Summary: Advantage Solution Manager 7.2. With Focused Build having installed a fullblown check functionality has been opted. With these additional functions you are also able to check some things in the standalone version 7.2 testing functionality. “Test Suite with project integration” assuming you have the Focused Build add-on installed. To check the testing abilities in a Solution Manager system version 7.2 without Focused Build you should provide the solution as an entry. In a Solman 7.1 system with the Focused Build (= FB) add-on installed the check report is a little easier but works well and can also be accessed by tcode /SALM/TM_CHECK. You should provide the SAP PPM project as a selection value. – classification of the test types. The test management dashboard in Focused Build will work after testplan generation. The selection criteria is an IT-PPM project in Solman 7.1 and the corresponding wave. How many test plans are assigned to my project? How many defects have been reported so far? How about the overall test status for my project? How is the overall test status? Whereas the overall test status can be seen with the information about how many percent of the specific test types (SFT, UAT, RT, FIT) are Ok in the selected wave. (Remark: a wave is 1 to many sprints. Work packages are put into waves and are build within these). How many test types resulted in priority high and very high defects? (for the selected waves). c.) More detailed dashboards for experts usage showing pro-actively in a detect-to-correct manner which actions are required next. For me it seems that the solution-readiness-dashboard and also the test management dashboard belong to the governance dashboard type. How Focused Insights can be used to get an ALM (= application lifecycle) overview of your projects and operations work will be adressed in my next blog. (tcode SOLDOC). Alternatively use the test suite (test preparation) instead. Select a process / process-step. (select new –> test cases –> test document (upload) for example). Choose a document from the file explorer. Upload it. Enter additional attributes and save the test case. Start the test suite – (test plan management) in the role “test manager”. Create a test plan (enter testplan ID, a description … in the area “process documentation”, ..) & Select the appropriate solution, branch, view and system role ID as used in 1. Set a test classification and test document type. Enter the planned starting date and planned end date. Switch to “test case selection” and select the test case from 5. And how can customers extend the app /SALM/MANGO_TESTER? I don’t see any documentation at all about it.